Pour les articles homonymes, voir Crisp. 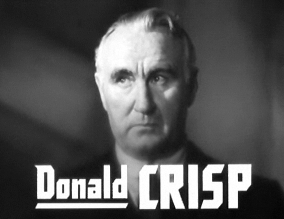 Donald Crisp est un acteur, réalisateur, producteur et scénariste britannique né le 27 juillet 1882 à Bow à Londres (Angleterre), et mort le 25 mai 1974 à Van Nuys en Californie. Donald Crisp has done hos most notorious movies with Bette Davis.First with Jazabel in 1938 and then in The Old mais in 1939 still with Bette Davis where in both production he played a doctor. A doctor with courage showing everyone the right way to be followed. Crisp eas known for his strong caracterer on the screen and was also a good medium to what a doctor should be in the years the both movies refered. 1937 : Une certaine femme (That certain woman) : Jack V. Merrick Sr.
Oscar du meilleur acteur dans un second rôle en 1941 pour Qu'elle était verte ma vallée (How Green Was My Valley) dans le rôle de Gwilym Morgan. Ce document provient de « https://fr.wikipedia.org/w/index.php?title=Donald_Crisp&oldid=158183675 ».